FREE! First Class Shipping on ALL Orders!This versatile, gorgeous hammered sterling silver necklace is a modern take on a classic design. The thick oval ring holds the circle, yet still allows it to move. It lays beautifully on the wearer, and brings many compliments. It can be stamped in any of our fonts. The number of characters will be dependent on font choice, but 28 letters/spaces is a good guideline. The "circle" pendant is thick cast sterling silver, and not thin cut sterling sheet like some. We think you will be pleased with the weight and quality. 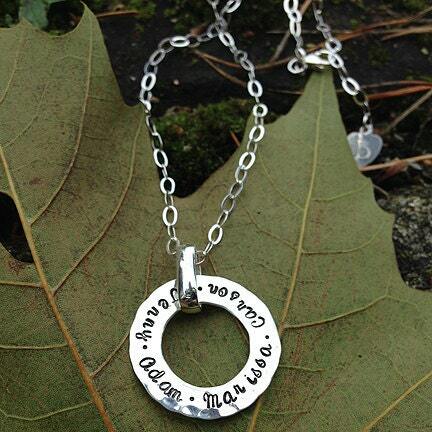 I ordered this engraved Circle Pendant to replace a Mother's Day gift from my daughter that I lost. I just received my new necklace yesterday and it looks as beautiful as the original. Bonnie, the owner of Birth Designs, helped me from day one. She went back through her sales history to find what my daughter ordered and duplicated it exactly!! Customer service at Birth Designs is top notch. I wish I could give them 10 stars, or 100 stars!! A strong willingness to please, friendly, professional, quality material and workmanship - people, you will love doing business with Birth Designs!